14:28, Xi’an Monday May 12th. My opposite number and I were deep in conversation about academic targets, when we paused to ask each other who was moving the table between us, as if one of us had a knee under it and was vibrating about as fast as they could. About the time we had decided it was neither of us, there is reaction around us and we declare, in an unspoken way, an emergency. Since we are only on the third floor (second in Britain: odd, since China allegedly invented zero, that they count from one and we in the UK from zero). People are moving in a fairy orderly fashion towards the staircases. Our office makes it easy to be sure that the classes are empty on the way. The corridor is a cantilever over an open space and as such vibrates quite freely – I now know. The vibration is in the region of five cycles a second and the amplitude has grown from the odd centimetre to five or more, depending where you are standing (and how high up). A couple of moments felt like the worst of sailing on a crosscurrent, with the floor vibrating in more than one frequency. There were moments on the stairs where the biggest danger was the risk of someone tripping. I feel for the several students with crutches (unaccustomed as we are to exercise here, the number of injuries leapt when the nice weather began). Outside, it seems obvious to me that one should collect where we stand most Monday mornings for the flag-raising ceremony. Clearly no-one has any practised instruction; we have been asking about fire practices and the like since October. The ground outside is pretty stable, but as I look at one of the new buildings rising next door, I can see its position relative to another part of school. The building under construction is twenty floors high and about a hundred and fifty metres away. I see a wave travel up the building, getting visibly larger as it rises, so if I am seeing it, it must be over a half metre of amplitude. Eventually, within the next fifteen minutes, it is decided by the ranking Vice-principal that we really ought to be in a bigger open space, so we troop across the dual carriageway outside the school gates to the large open (treed and grassed) space between that road and its parallel partner about a further fifty metres away. We stay there for the rest of the afternoon, declaring that people can go home around 16:30 and with some staff still in the vicinity as midnight approaches. Unable (not permitted) to return to the building (all public buildings are deemed unsafe for the time being) one goes home directly and goes for a run (what else to do? The excitement is over.) Trafficking the streets tells me what else is going on; some have found tents already, the traffic is about normal for the time of day. I realise that anyone inside vehicle at the time possibly did not notice the tremor as it passed—even though the whole episode lasted maybe six minutes—and that the parents collecting their kids are more spread in time than usual. Wonderful thing, modern communications: while stood with the kids in the park (incredibly well behaved compared to Britain) we, the collective we, discovered that the epicentre was Chengdu, that it was felt in Beijing (a parent rang to ask about her child in our A2 class), that it was already noticed in Shanghai, that comms was down for much of Sechuan (or Sichuan) – which is how we deduced that was the epicentre until we caught a newsflash from a more modern phone. Our physicist, home for the afternoon, was meanwhile sat outside his flat, on the edge of the school playing field, with his Mac open and connected, so collecting—and sharing with his neighbours—far more information than anyone else at the time. During the night, 04:15 on my watch, there was another vibration which shook my bed by the odd inch for another twenty seconds or so. 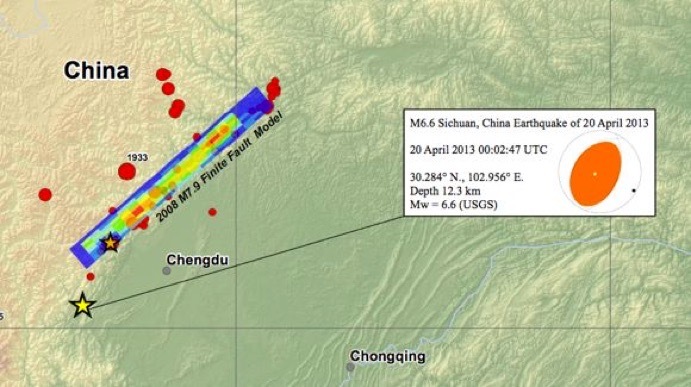 Writing this on the Thursday, we now know there have been several earthquakes, the biggest of 7.9 at Wenchuan, some 90 km from Chengdu, over the QinLin mountains from here and about 600km away. The subsequent quakes have been around the 5.1 mark and have travelled up the fault that lies along the edge of the scarp running from NW of Chengdu in a roughly NE direction (towards Xi’an, but it doesn’t go that far). The fault is one that is pushing up on the west side and the first has set up a zipping effect along the fault line (in both directions, I expect). However, the fault doesn’t run very far, in global terms. Even so a minor event yesterday lunchtime (so almost a day later) was only 400 km away from here. There was an earthquake in Xi’an, known as Chang’an at the time, in, I think, 1556. At that time many people lived in caves and in consequence the death toll was instantly very large, as basically the caves allowed the ground level to drop by the odd metre or two in short order, crushing anyone inside. This 7.9 is the biggest for 30 years, I am told. Reading up on this a little, I see there are Love waves¹, s and p waves, Rayleigh waves. The earliest of these are sensed by animals other than insensitive humans, which can do a little about moving away before the larger, slower and more destructive Love waves arrive. The speed of the waves, says Wikipedia, varies with the ground density and I think we are talking aircraft speeds here. The size of the wave rapidly diminishes with distance but the type of wave depends greatly on the depth at which the tremor starts, since that determines how the wave is revealed on the surface, where we live. You can read up on this for yourself. China is very good, for a large country, in providing support to its people. At an individual level, not much happens, but at a city level, a lot occurs that helps the individual. It is difficult or a westerner to appreciate the scale of this country. The cities are huge; the countryside is also vast and even when you think it is empty, the number of people nearby is greater than you expect. Thus a place of a size considered significant in Britain can be ignored here as irrelevant, not in any nasty way but more like the Vulcan² saying, “the needs of the many outweigh the needs of the few”. Read, 201005, John Bell’s account of the effect of earthquakes upon the Warriors. Google ‘All under Heaven’ with his name; this link http://tinyurl.com/y9vteor may work. 2002 09 22 - United Kingdom - M 5.0 I think this may have been Cornwall. I didn’t notice it. At least 19,500 people killed and severe damage in the Dujiangyan-Mianzhu-Mianyang area. Landslides blocked roads and buried buildings in the Beichuan-Wenchuan area. Felt (VII) at Chengdu, (VI) at Xi'an and (V) at Chongqing and Lanzhou. Felt in much of central, eastern and southern China, including Beijing, Guangzhou, Nanjing, Shanghai, Tianjin, Wuhan and in Hong Kong. Also felt in parts of Bangladesh, Taiwan, Thailand and Vietnam. 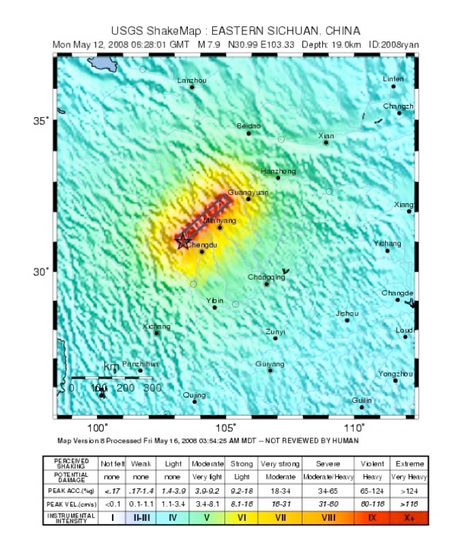 The Sichuan earthquake of May 12, 2008, occurred as the result of motion on a northeast striking reverse fault or thrust fault on the northwestern margin of the Sichuan Basin. 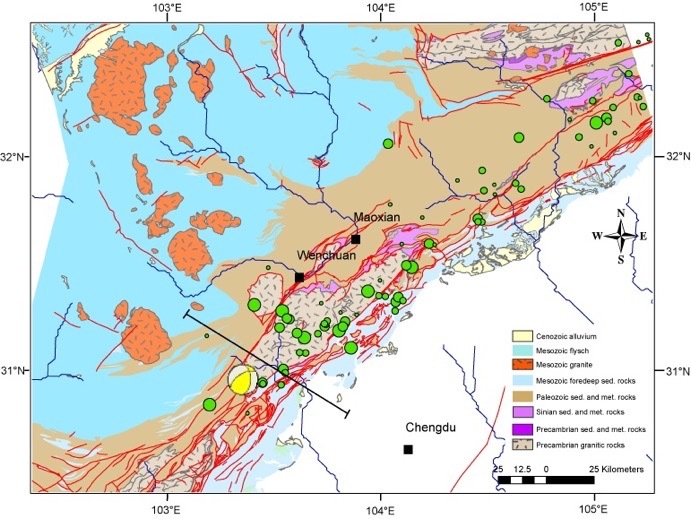 The earthquake's epicentre and focal-mechanism are consistent with it having occurred as the result of movement on the Longmenshan fault or a tectonically related fault. 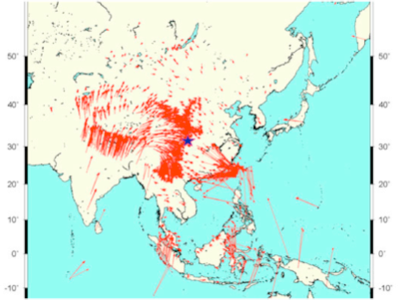 The earthquake reflects tectonic stresses resulting from the convergence of crustal material slowly moving from the high Tibetan Plateau, to the west, against strong crust underlying the Sichuan Basin and southeastern China. 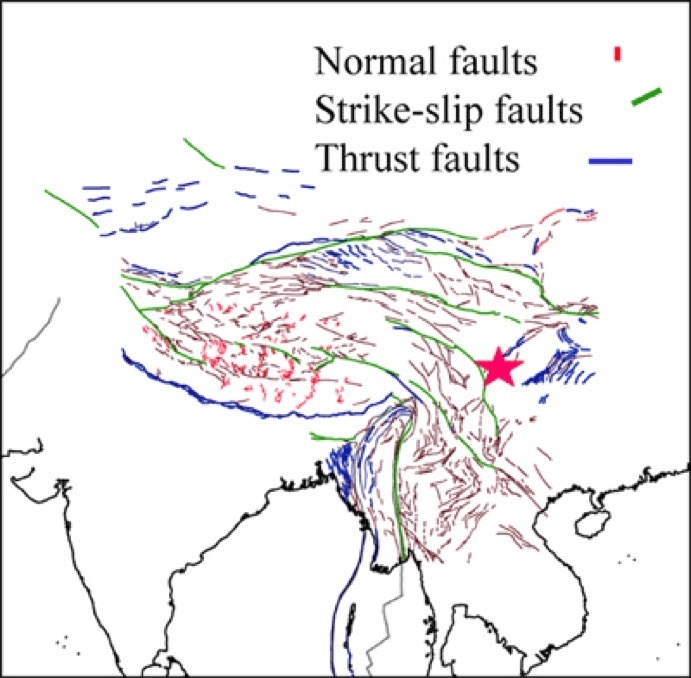 On a continental scale, the seismicity of central and eastern Asia is a result of northward convergence of the India plate against the Eurasia plate with a velocity of about 50 mm/y. The convergence of the two plates is broadly accommodated by the uplift of the Asian highlands and by the motion of crustal material to the east away from the uplifted Tibetan Plateau. 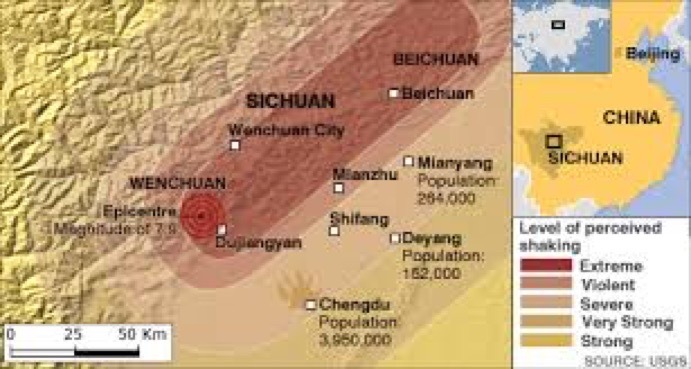 The northwestern margin of the Sichuan Basin has previously experienced destructive earthquakes. The magnitude 7.5 earthquake of August 25, 1933, killed more than 9,300 people. Adding to this on Tuesday, 20080520, we have been sent home from school because of the likelihood of aftershocks. I printed out a list of quakes from the last ten days and last Monday was the first, at 7.9 and 6.0; then a long succession of tremors between 4 and 5.7, all in the zone marked above and shown again below. So you can see that the range is well-confined and that the recent activity is small. Why then are my colleagues so scared, why is everyone outside all afternoon again? Part of the answer is uninformed decision-making, part because we are all like sheep. Typical thinking says this line is pointed at Xi’an, so panic; typical local thinking says a quake of any number is equally important; typical thinking says anything you can feel should be (have been) experienced while outside. Yet the guy upstairs who fell over had more effect on the building than a 4.5 tremor starting 200 miles away (I worked it out). It is likely that the wave attenuates as the square of the distance; we know the scale is logarithmic. So comparing a 7.9 from 400 miles away with one 200 miles away will give 4 times the effect felt; however, if the tremor is a 5.9 only 200 miles away then the quadrupling is compensated for by the diminution factor of 100; 25 times less than the 7.9/400 experience. The biggest quake predicted is a 7.0: if it was a 6.9 from 200 miles, that still makes it 2.5 times less, a mere 40% of what was felt on the 12th. The sun had an ice-ring around it this afternoon – high ice in the atmosphere providing a white ring quite a way from the sun in the sky. This was immediately connected to the likelihood of a quake. This pagan, peasant, illiterate and unintelligent thinking gives me a feeling of despair. At least in Britain I could make comment and be known to be teasing. Here, the number of people truly scared witless is evidently high. Pictures replaced 2016 after files refused to update. 1 ”Did the earth move for you?” must be a geologists joke, surely, knowing of Love waves. beer (if you don’t ‘get’ this you need to read about hashing elsewhere on the site) in a village square that had a large picture of Mao painted on a wall. He has his hand up in some sort of salute, as in this photo I found on the net. 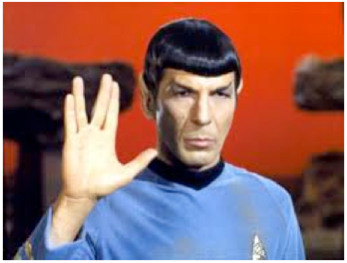 We all saw this as a message of antithesis to teh Vulcan one, and tried not to share too loudly with our local friends. Unconscious humour. I hope; the overlap is just possible. 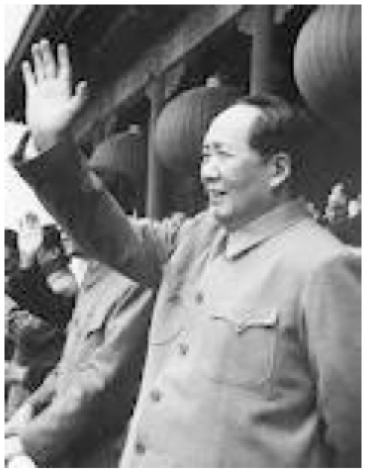 “Mao zhu xi wan sui”, C says, is the matching phrase: she is convinced that the hand signal is accidental.